39 year old, and life puts ahead a tough test. After 28 days of desperate fight for life, coming back from hell: fear, distress, anxiety… There is no medication that can control his despair. Or maybe yes?. His wife comes into the box, takes his hand and stays with him, no need to talk about. After many hours without sleep, he closes his eyes and rest peacefully. 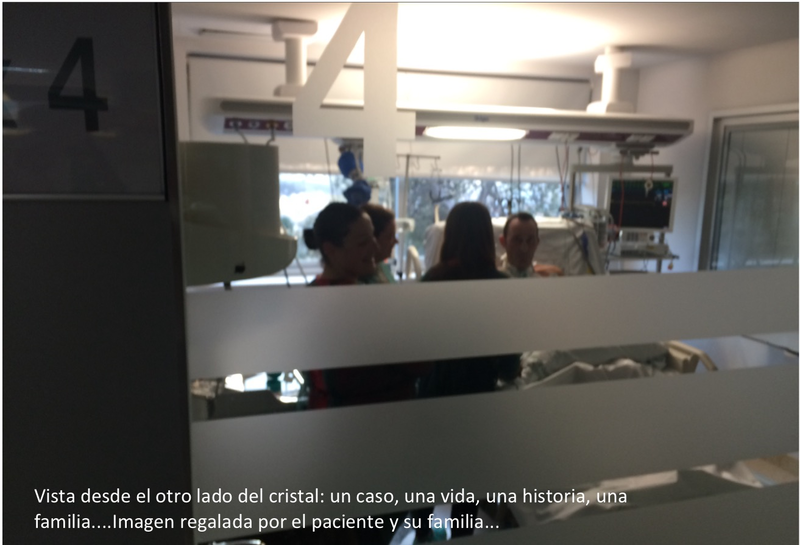 From that moment, Yolanda is part of the health care team, she is inside the box with her husband practically all day, our ICU is “open”. Days pass and the desperation to get out of the ICU is the irrepressible desire to embrace their daughters. He could talk to them thanks to the valve in his tracheostomy and… Why not? In our ICU patients may already have their mobile phone. But it is not enough. Beautiful bright eyes with the innocence of her 12 years, full of emotion and love waiting in the room, from too many days ago. 28 days of desperate fight for life, coming back from hell: fear, distress, anxiety… And “his girl” came into the ICU.. In the box are heard laughter and kisses, tears of joy and “I love you’. On the other side of the glass, the people in green pajamas, with a knot of excitement in the throat and the satisfaction of having done something good. Small steps that break great barriers. Do not separate families in the hardest time of their lives. Opening the ICU doors.